Flying with a paratrike or just paragliding is a breath-taking experience, and one can relax while admiring Kassandra from above. - with a paratrike which is double seated motorized paraglider with wheels which enable easy take-off and landing. The passenger simply sits into the comfortable seat and after a short ride, the glider lifts you in the air. The typical flight lasts 20 minutes but we can arrange various duration flights. 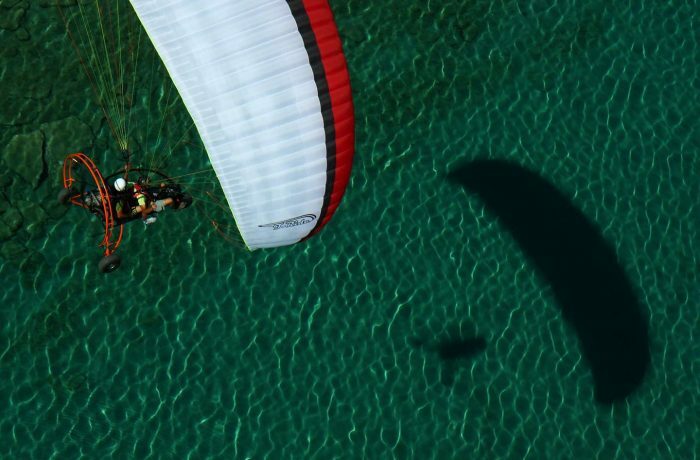 - Free paragliding by using only natural thermic flows in the atmosphere to hold up and move in the air. Enjoy the experience of free flying and loosen up yourself with total security in the hands of the prfessional pilots. No previous experience is needed.